Pakistan Peoples Party Chairperson Bilawal Bhutto Zardari visited Lyari on Sunday to kick off his election campaign in the area. He will be contesting from Lyari's NA-246. Speaking to supporters on the ICI Bridge, he said that this was his first time campaigning for the elections and hoped that the people of Lyari would stand by him. The PPP has always stood by the underprivileged, said Bilawal. He also toured the area, waving to people while standing through the sunroof of his vehicle in a scene reminiscent of his mother's campaign. The PPP chief was met with conflicting shouts of 'welcome Bilawal' and 'go Bilawal go'. People showered him with roses and waved PPP flags as he passed by them. He was accompanied by workers and leaders of the party, such as Sherry Rehman and former Sindh chief minister Murad Ali Shah. PPP leader Nabil Gabol made a grand entrance to Bilawal's public gathering by arriving on a donkey cart. The former MNA said riding on the donkey cart reminded him of the past. Residents climbed onto the roofs of homes and waves empty bottles and other containers, yelling out 'give us water'. A fight broke out between PPP supporters and angry residents. The police were called in to disperse the protesters. 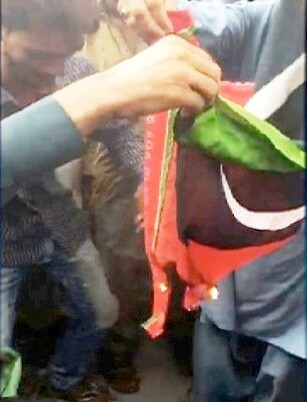 Angry residents threw rocks and the PPP supporters. According to the supporters, supporters of the MQM are creating tension in the area and starting fights. Bilawal's convoy was near the child dispensary in the area when the fight broke out. His rally was stopped and the PPP head stayed in his vehicle during the incident, while Shah sat in the driver's seat. 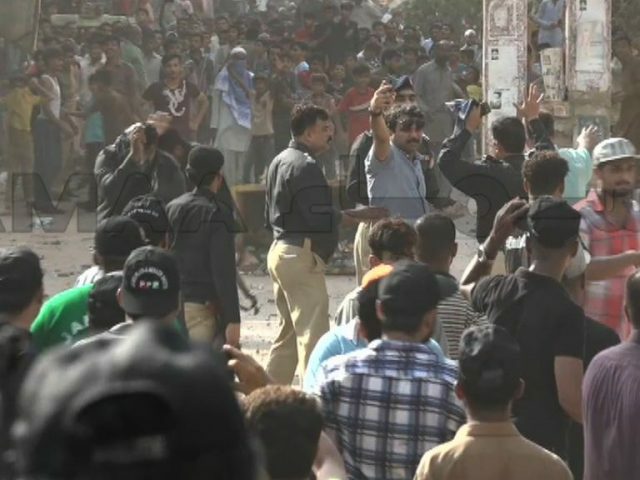 According to SAMAA Karachi Bureau Chief Faisal Shakeel, the protests broke out when Bilawal arrived in the Kachhi area of Lyari. He said party workers claimed the protesters were from a rival political party. He said Bilawal had surprised the people by visiting the area for the second consecutive day. Shakeel said that the PPP probably did not realise that the people of Lyari would have such an adverse reaction to Bilawal's visit, since the area has been the PPP's stronghold for years. He went on to say that Bilawal and the PPP are both worried about the situation. His security team surrounded his vehicle and told him not to exit the vehicle until they clear the area. The police advised him to change his rally route. The windscreen of Nabil's Prado was also damaged in the incident when rocks were thrown at it and protesters attacked it with sticks. The windscreen of a crane that was travelling in front of the convoy was also smashed. The protesters grabbed the flag off Nabil's vehicle and set it ablaze. The police have not confirmed who was behind the incident, despite the PPP's allegations that the MQM is behind the incident. PPP leader Nadia Gabol said the party has always stood up to violence and that they will continue their rally. Senior party leader Nisar Khuhro spoke to SAMAA TV and said that the PPP is an old party. Incidents like this also occurred during Benazir's time, he said. They will not be able to stop Bilawal. This is a fight for democracy, he stressed, adding that the people must vote. Khuhro said it cannot be said who these people are backed by. Nadia said people forget who Bilawal's mother and grandfather are. He will fight these people, she said. When asked about the water shortage in the area and the party's performance in the area in the last five years, Khuhro questioned whether the MQM or military dictators had solved the water issue. MQM's Mehfooz Yar Khan, who is also contesting from the area, told SAMAA TV that die-hard PPP workers in the area are dissatisfied with the party. He said the incident is the common man's reaction to the PPP's governance. He said the MQM received a very positive response from people in the area. He said he was in the area before Bilawal's rally reached the area. Nabil also spoke to SAMAA TV and said that Bilawal will continue touring the area for another three to four hours. He claimed that supporters of Tehreek-e-Labbaik were behind the incident, saying certain elements had misguided residents of the area. The PPP chairperson spoke to supporters when he reached Chakiwara. He promised to fulfill the promises he was making to the people of the constituency. He said he would provide water to the people of Lyari, even if he had to have seawater treated at desalination plants. Bilawal said there were elements that did not want the PPP to make Lyari into the one Benazir dreamed about. Bilawal Bhutto said he will not be deterred by violent elements who are trying to scare the PPP workers. "I am Shaheed Benazir's son, who was one of the bravest souls in Pakistan. Lyari is in my blood. I will go to every nook and corner of the country with my party manifesto. We have to defeat these violent elements; not give in to them. I will not be scared into submission by such forces," said Bilawal Bhutto.